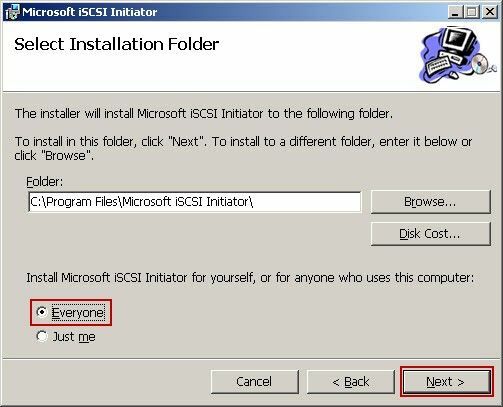 If you system is Windows 2003, then you need to install the iSCSI program. If you system is Windows 2008 or Windows 7, then you do not need to install the iSCSI program, because the system has iSCSI program. 1) Double-click the "iSCSI" setup, it will pop up the "installation wizard" dialogue box, and then click "Next" button (Figure 1‑1). 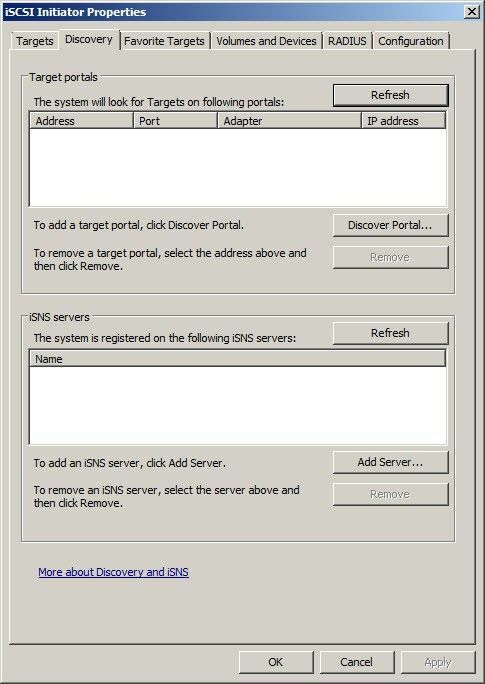 2) In the pop-up "Select Installation Folder" dialogue box, select the installation directory, and then select the "Everyone" button, then click "Next" button (Figure 1‑2). 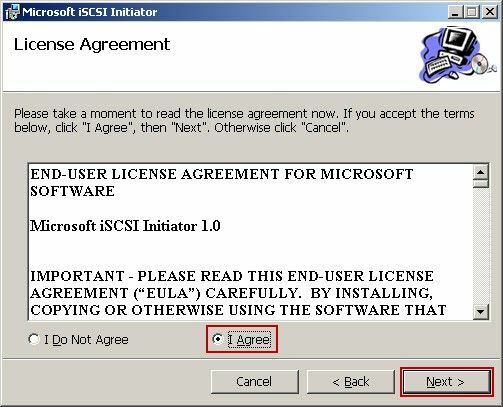 3) In the pop-up "License Agreement" dialogue box, select the "I Agree" and click the button, and then click "Next" button (Figure 1‑3). 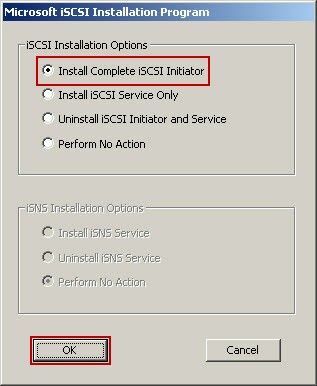 4) In the pop-up "Microsoft iSCSI Installation Program" dialogue box, select the "Install Complete iSCSI Initiator" and click the button, click "OK" button (Figure 1‑4). 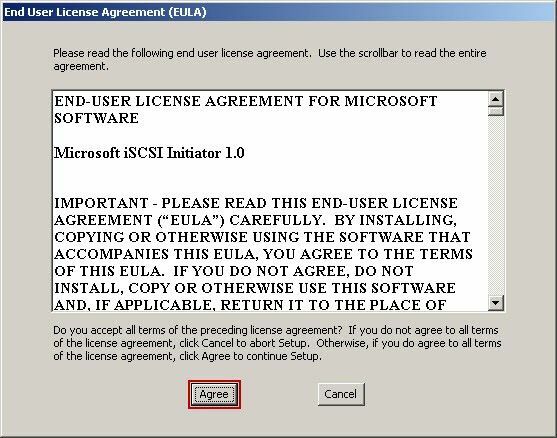 5) In the pop-up "End User License Agreement" dialogue box, click the "Agree" button (Figure 1‑5). 6) After the successful installation, click "OK" button (Figure 1‑6). 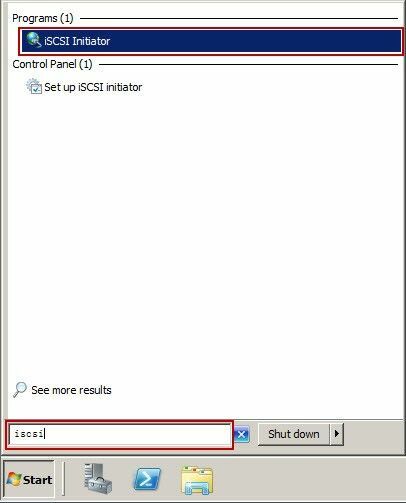 1) Click "Start" button, and then in the "Run" edition box, enter "iSCSI", then click "iSCSI Initiator", run "iSCSI" (Figure 1‑7). 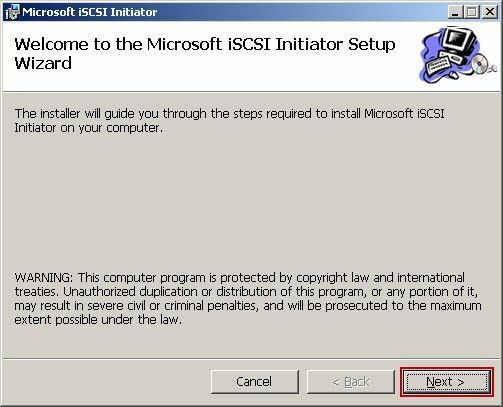 2) In the pop-up "Microsoft iSCSI" dialogue box, click the "Yes" button. 3) It will pop up "iSCSI Initiator Properties" dialogue box (Figure 1‑8).